With only seconds remaining, Pughy shot home from close range after another of this summer’s GCSE candidates, Neil Trotman, had caused havoc in the Walsall defence with a long throw. Oldham’s defeat of Preston tonight now means four points from the Clarets’ remaining two games will ensure safety; three points will need reference to arithmetic. Further injuries to Liam Eves, Joel Pilkington and Robert Grimes had reduced the Supremo’s squad to the barest of bones, with six schoolboys included. One of these, Tom Ince, made his first start at this level at the age of 15 years 8 months and 27 days prompting speculation that this could be the youngest reserve full debut in the history of the club. There’s probably no way of verifying this, but even if it is not the case this still represents a tremendous achievement for young Tom, who continually delighted the crowd with his close ball control and quick breaks. Walsall coach Mick Halsall too had opted for youth, with only 21 year-olds Gary Birch and Mark Wright with first team experience. Included was 17 year-old striker Matty Fryatt who had scored against us in an impressive performance at the Bescot a fortnight ago. The Clarets dominated the first half leaving Marlon with little to do in goal. Once again we played 4-5-1 with Hindle a lone striker, but he was ably supported by the midfield controlled by Tony Grant. Assuming the Richard Chaplow role, Grant played deep, collecting the ball from the defence and distributing it well with some fine passes. In fact the Clarets could have been three up after only twenty minutes. Damo almost slid in a Carpenter cross; Rasmussen fired wide after great skill from Ince had set up the chance; and Waine shot over from a Ras cross. In between, Marlon got in his only action of the half, tipping over a fiercely driven free kick from Kris Taylor. Walsall, with an outside chance of the league title, were trying to get forward as often as possible, but the Clarets defence, with Leeson and Townsend a strong central pair, were giving them a hard time. However, right on half time Scott produced a fine block to charge down a Fryatt drive. This seemed to act as a spur to the Saddlers for in the second period they were much sharper, and looked the more likely to score. Darryl Avery, another schoolboy debutant at this level, replaced Grant for the second half, presumably following another decree from the watching Stanley Augustus. Expect Grant to feature against Sheffield Wednesday. The Clarets now were not as fluent going forward, and were struggling to get the ball up to Hindle. Rather than playing their way out of defence, too often the ball was booted upfield, invariably to return immediately. Walsall, in contrast, began to grow in confidence, and after the dangerous Fryatt had rattled the bar in the 68th minute they took the lead two minutes later. A quick break caught the Clarets defence out and Fryatt was played through on goal. With great coolness he went round Marlon and slotted the ball home from an angle. The Clarets rallied following this blow, and with Trotman (debut again) introduced to partner Hindle up front Burnley now began to force Walsall back. However, things didn’t look good when, with ten minutes remaining Damo collided twice with the goalie in a minute and, following a check from the doctor, had to disappear down the tunnel for treatment. Once again Hindle had had a fine game, and if fit will surely be on the bench against Wednesday. Having used their three subs already the Clarets were now obliged to complete the game with only ten men. But this didn’t seem to deter them. Leeson headed narrowly wide after great wing play from Pugh, before that last minute drama earned the Clarets a deserved point. Both teams left the field to generous applause from the 182 spectators. It had been an entertaining game, and the young Clarets have now given themselves a fighting chance of avoiding relegation, firstly away at Tranmere on Monday, and then at home to Bury next Wednesday. 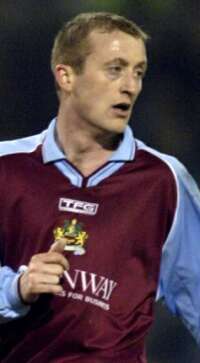 Burnley, in 4-5-1: Marlon Beresford; Danny Pitham, Andrew Leeson, Ryan Townsend, Paul Scott; Rhys Carpenter (Neil Trotman 72), Mark Rasmussen, Tony Grant (Darryl Avery 46), Andrew Waine (capt. ), Tom Ince (Marc Pugh 63); Damien Hindle. Subs not used: Michael Hale, Ross Preston. Walsall, in 4-3-3: Matt Harris; Ryan Willets, Mark Wright (Mark Branch 70), Gavin Caines, John Harkness; Craig Stanley, Daryl Taylor, Kris Taylor; Gary Birch (Bruce Wheeler 70), Matty Fryatt, Tai Atieno.